I’m back to baking… with a rum bundt cake!!! This is a moist, boozy cake super soft and delicious. I love incorporating different flavours in my cooking. And when I bake I like to include an alcoholic touch to it 🙂 One of my favourite drinks is rum, particularly dark rum and most of the time I have a bottle around the house. The day I decided to bake this cake I was in real need of inspiration. Then I spotted the bottle of rum and the decision was taken. A bit of internet research and I came across this rum bundt cake recipe. Sounded easy enough to make and with a delicious result! No idea if the invention of rum cake is documented but I was curious about the whole “bundt cake” name. And guess what I discovered? That it’s actually the name of the pan that you use to make the cake!!! Interesting, no? The bundt pan has a distinctive ring shape inspired by a traditional cake know as Gagelhupf popular among Jewish communities in parts of Germany, Austria and Poland. Bundt cakes do not conform to any single recipe. This pan generally has grooved sides, but its most defining design element is the central tube or “chimney” which leaves a cylindrical hole through the center of the cake. The design means that more of the mixture touches the surface of the pan than in a simple round pan, helping to provide faster and more even heat distribution during cooking. So basically you can bake any recipe into a bundt pan and it becomes a bundt cake! I honestly didn’t knew this… And I’ve had a silicone bundt pan for such a long time! Living and learning 🙂 But returning to the cake, it came out with just the perfect texture, moist and full of rum flavour. The boyfriend loved with his coffee and I even took it to the office: absolute success… so much that I only had a few pieces left just in time for the photo!!! Spray a bundt pan or alternatively butter and flour it. Whisk the flour with 1 3/4 cups of sugar, milk powder, cornstarch, baking powder and salt in a large bowl. Set aside. On another bowl, whisk 1/2 cup rum, milk, oil, vanilla and eggs until smooth. Pour the wet ingredients over the dry ingredients and whisk until just combined. Pour the mixture into the prepared bundt pan and bake until golden brown and a toothpick inserted in the middle comes out clean - about 1 hour. When ready, let it cool for 20 mins. Then unmold and let it cool down completely. In a small saucepan, bring the butter, remaining sugar and a 1/4 cup water to a boil, over high heat. Cook for 5 mins, stirring to dissolve the sugar. Remove from the heat and stir in the remaining rum. Place the cooled cake on a wire rack over a baking sheet. Poke holes all over the top and the sides. Slowly pour the rum glaze all over the cake, letting it soak into the cake. This looks and sounds really tasty can I be able to choose another drink to use? But that wouldn’t make it a rum cake I should just try it first because I don’t like how rum smells but maybe in a cake I wouldn’t mind. If I had to choose another drink I would probably for another king of spirit or even whisky. But you can’t smell the rum and the taste is not overpowering at all… Give it a go 🙂 it’s really tasty!!!! Looks easy enough for me to make. I don’t have rum at the moment though. Can I substitute rum with coffee liqueur and make it coffee bundt cake or something? I know the alcohol content of both are different so I’m not sure if that will have an effect on the outcome. I have been looking for a good bundt cake recipe! Totally trying this this weekend! Thanks! I LOVE budnt cake! It’s my Favorite and this recipe looks delicious! Sounds and looks yummy, will save this recipe! Pinned too! Yep, just what I need, lol! Definitely pinning for later, because, well, cake, you know! Alcohol in a cake sounds really good. I would have to try this in the future. Hehe. 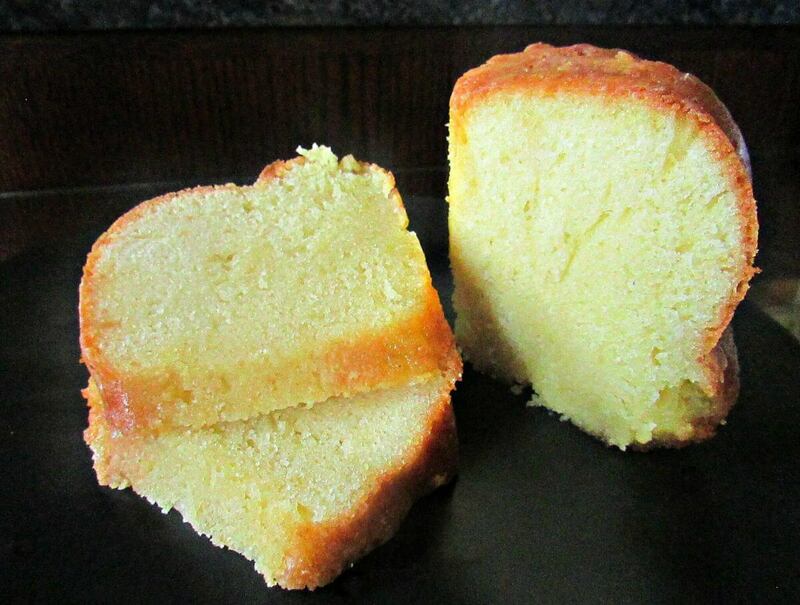 I’ve only had rum cake once before, so I will have to try out this recipe and compare. Looks amazing! The alcohol in the rum evaporates during the baking process in the heat of the oven, so what is left behind is the sugar and flavor and added moisture. Even a little goes a long way in baked goods. Yummy!